Introduction: Obesity is associated with an increased incidence of a variety of diseases including hernias. Super obese is defined as a BMI>50 kg/m². Very few reports have examined hernia repair outcomes in this challenging patient population. Methods: We performed a retrospective study from our ventral hernia database for the period 2002-2009. We looked at demographics, ASA class, wound classification, operative time, operative technique, initial vs. recurrent hernias, morbidity, and mortality. Results: A total of 45 patients were included, with the vast majority (43) being female. Average age was 47.8 + 10.4 (mean + SD). Average BMI was 57.3 + 7. Mean operative time was 1 hour 55 minutes. Regarding wound classification, we had 80.8% clean, 17.8% clean contaminated, 0% contaminated, and 2.2% dirty. ASA class was mainly ASA 2 (26.7%) and ASA 3 (66.7%). We had 33 (73.3%) initial hernia repairs and 12 (26.7%) recurrent cases,. The recurrence rate overall was 8.9%. A laparoscopic approach was used in 28.9% of cases, and an open approach in 71.1%. Overall morbidity for the group was 33.3%. Of these morbidities, there was an 11.1% incidence of wound infection. Seroma formation was 8.9%. Mesh infection was 0%. We had no mortality in this group. Conclusions: Given the recent increase in the super obese population, a better understanding of the risks and challenges of this group is mandatory. 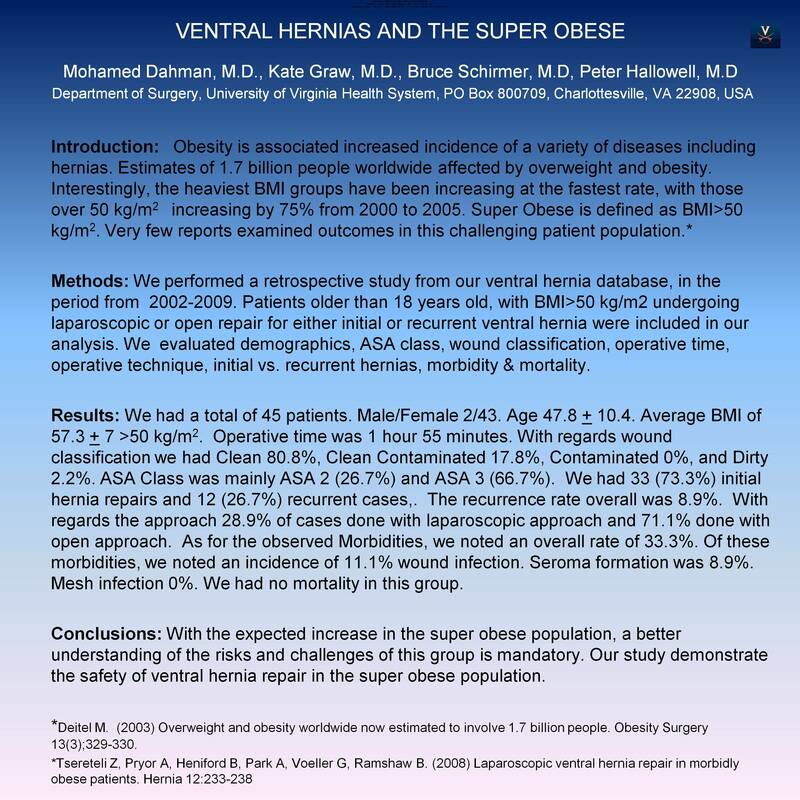 Our study demonstrates the safety and efficacy of ventral hernia repair in the super obese population.